Plaza de Armas, San Antonio, Bexar Co. Owner: City of San Antonio | Architect: Ford, Powell & Carson, Architects and Planners, Inc. The Plaza de Armas Building sits on San Antonio’s historic Military Plaza and is a set of four historic structures dating to the 1880s and 1890s that were combined into one large office complex in 1979. 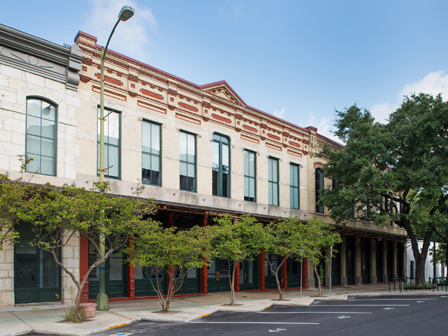 Its rehabilitation as a mixed-use complex allows the City of San Antonio to maintain a series of historic facades on one of the most historically significant public spaces in Texas. During the rehabilitation, a non-contributing modern addition was demolished at the rear and the exterior was restored using matching brick salvaged from the interior. Exterior improvements include new roofs and masonry repointing using mortar matching the historic mix. Masonry was cleaned and loose stucco was replaced. The entire exterior also received a new coat of paint and light wells to the basement received new, glass-block pavers at the sidewalk level. The interior of the project created city offices on the second floor with retail, TV studios and a multipurpose space at street level. Masonry party walls and wood floor joists were left exposed on the interior wherever possible to highlight the historic construction technology of the building. Despite minimal original material in the interior, the rehabilitation of this historic complex proves that San Antonio’s old buildings can continue to evolve along with the city itself.